Can you believe it’s almost time to start thinking about holiday cooking already? It seems like just two months ago I was taking down the Christmas lights from the front porch! Oh, wait, it was. Yeah, I’m one of THOSE people, that forgets random Christmas stuff for like 7 months. Anyway, here we are in October already! Halloween is flying up on us. Once that hits, there’s no break between holidays before the new year! I love kitchen gadgets. I get it from my grandmother. She was the kitchen gadget queen! When BuyDig told me to pick out a few things for review and for this giveaway, I immediately went to the kitchen section to poke around. I came up with a few must-have kitchen items that I think will help make all my holiday baking so much easier. As most of you know, the holidays are the only time I really do any sort of cooking or baking! They each have their own blade cover, so I don’t slice my fingers off when reaching into the drawer for them. 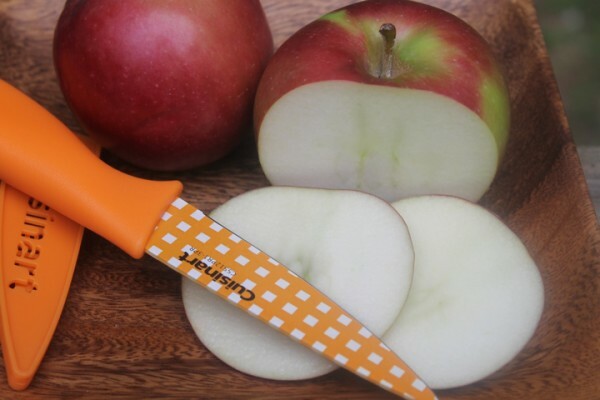 The non-stock color coating isn’t just super beautiful, it helps you remember which knife you used for which purpose, so you avoid cross-contamination. These are a MUST for Thanksgiving! I’ve been wanting a stick blender for a while now. I make a ton of cookies during the holidays and the big mixer is just too much for me to deal with. I don’t understand all the buttons. 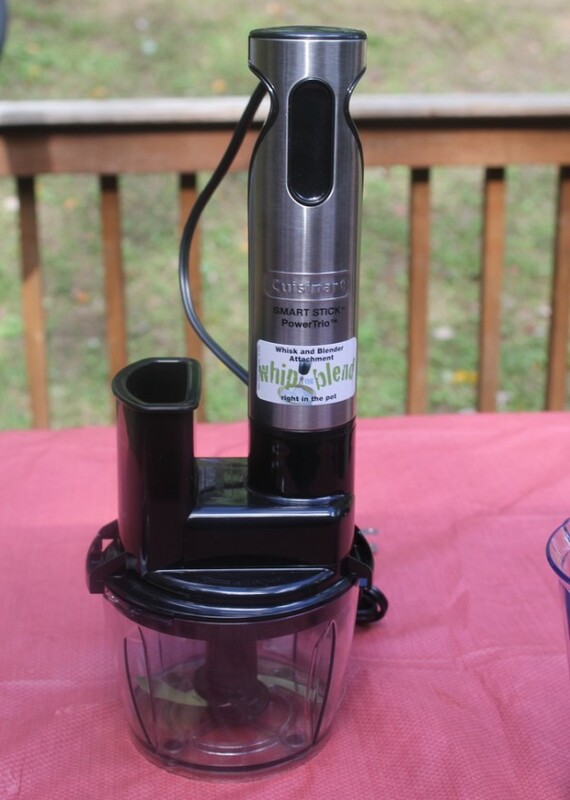 When I saw the Cuisinart CSB-80, I was drawn to all the extra features that came with it. 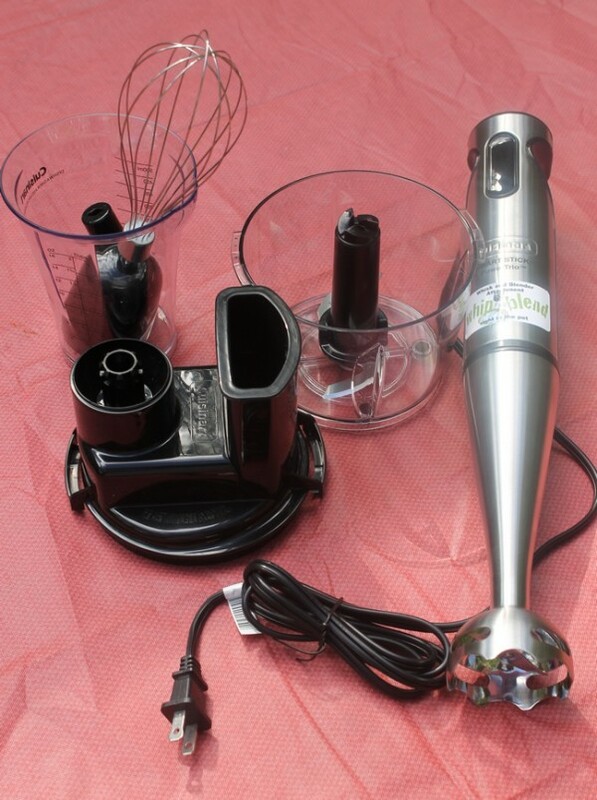 I was originally looking at a plain stick blender that basically just blended, but this one had attachments and choppers and cups and oh-my-goodness stuff galore! Plus it has a powerful 400-watt motor. This beauty doesn’t just blend, it’s whisks and chops! It takes the place of my mom’s big mixer with the confusing buttons AND the handheld mixer that I keep losing the beaters too AND the chopper. The AirFryer is another item that’s been high on my kitchen gadget wish-list for a while now. I love the idea of eating fried foods without the fried calories. I also love anything that cuts back on the work I have to do to get real food on the table. Example: Jake and I both love sweet potato fries, but I don’t really love the whole process of emptying the random trays out of the oven, preheating, baking, cleaning it all up, etc. With the AirFryer, I can dump the fries into the try, turn a knob to set the heat, a knob to set the timer and actually have my fries in like 10 minutes. Plus they taste better! The Philips AirFryer isn’t just for making french fries! You can make all sorts of things in it! I’m still experimenting. I wanted to make fried apple chips, but I didn’t quite master those yet. I did, however, make the perfect grilled cheese! Seriously, it was amazing! Crisp bread on the outside, melted cheese on the inside. It took about two minutes to prep and 6 minutes in the AirFryer. I was free to do other things while my lunch was cooking! I can see using this during the holidays for all sorts of appetizers! You can even bake in it, although I haven’t tried that yet. 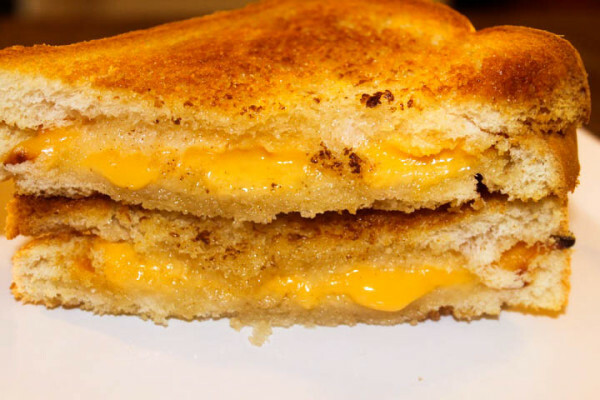 To make the perfect grilled cheese sandwich: just butter all sides of two slices of bread, place a slice of cheese in between the two slices, lay it flat in the basket of the fryer, then turn it to 390 degrees for 6 minutes. With these three fabulous kitchen gadgets from BuyDig, I’ll be able to whip up more delicious cookies and baked goods, save oodles of time making dinners and appetizers, and precisely slice, dice and chop until my heart’s content! All of this and so much more is waiting for you at BuyDig! Check them out on Facebook and Twitter to keep up with news. Need a little help deciding what to get? Follow on Instagram and Pinterest to see their latest and greatest offerings! Total value is around $250! Giveaway is open to US residents age 18+ and ends on October 27th. Good luck! My dream would to own the Cuisinart SM-70BC 7-Quart 12-Speed Stand Mixer, in Brushed Chrome! I’d love to get the Fitbit Surge Fitness Superwatch. I would like the Hewlett Packard 17.3″ Envy TouchSmart 17-j140us Notebook. My dream would be to have the Dell i5558-5002SLV 15.6″ Touchscreen Intel Core i5-5200U Laptop – Windows 10 OS. I need that cool knife set! I love how colorful it is. What a great giveaway this is. What cute kitchen essentials to have for the holidays. I like them all but esp the Philips AirFryer. Wow, I love that hand blender. Thanks for a great giveaway! Cuisinart seriously has some of the best kitchen gear. I haven’t tried the knives they offer but they sound great. I’d LOVE the Samsung UN55HU8700 – 55-inch Curved 4K Ultra HD 120Hz 3D Smart LED TV since my current TV is on its last legs. I could use a new keurig! I could use those sharp knives. My current ones just don’t cut it. ? I like the Nikon COOLPIX P7800 12.2MP 7.1x Opt Zoom 3″ LCD Black Digital Camera. I want the cute knife all set this is the set that i need for everyday of cooking. Our desk top just gave up e ghost…but, like you I adore anything kitchen..I need an air fryer and soon our coffee pot is going to give up..I was looking at their thermal coffee pots. Nice ones. I’d like anything that would be given to me free of cost! 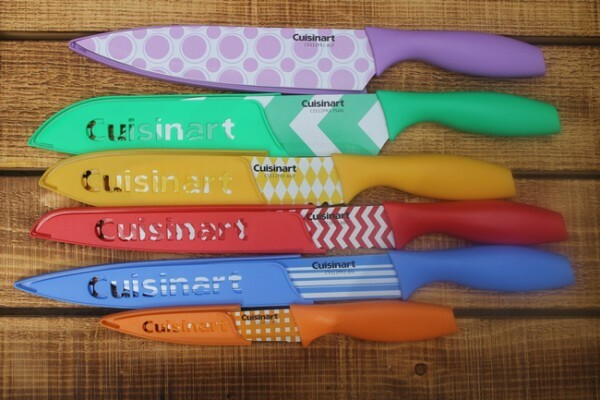 The Cuisinart knives are so cute! It would be nice to look at sitting on a knife block. Thanks for sharing! I would take any of the laptops offered at such great prices. Those knives are adorable. I could really use a new set. I’m loving these products! The Canon Rebel of course…but on the lower scale I’d like Cuisinart food processor! I love the knives! Actually, I love everything, but the knives are my favorite. I would love to have a Hewlett Packard 15-p030nr 15.6-Inch Special Edition Laptop w/ Beats and AMD Quad-Core Processor! 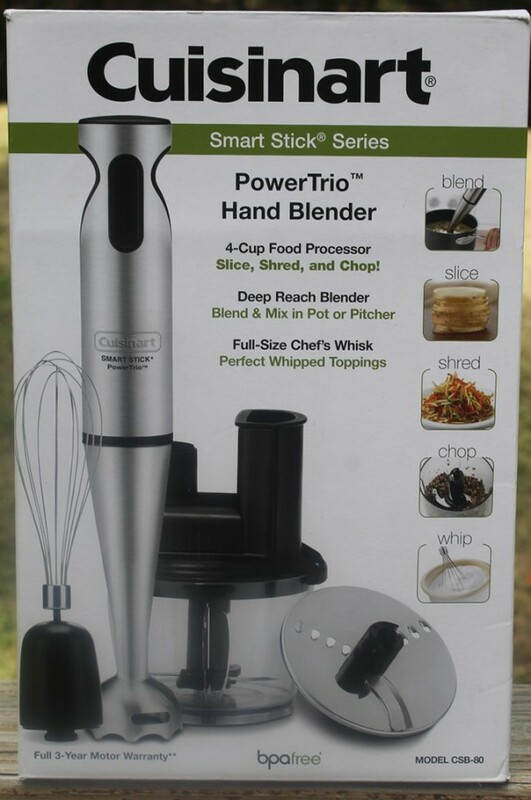 I would love the have the hand blender and the knife is great for new kitchens as well as pros. Great giveaway! I’d love to get a Soft Serve Ice Cream Maker! I’d get it in pink for my teen daughter! I saw eggnog in the store today, its too early to start thinking about this holidays! Lets get through Halloween first? LOL, I hear you! Although in the retail world, I think it’s almost time for Easter! I could use a new knife set. 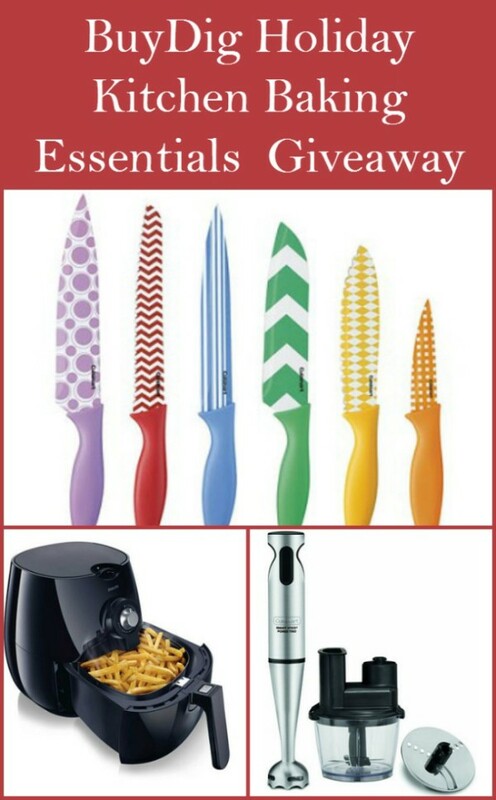 these knives are awesome and I would love that air-fryer. I do want those ceramic knives in the worst way. Those look and sound amazing. I would love the Cuisinart Convection Oven. Pavilion 17.3″ 17-f230nr Notebook PC – Intel Pentium N3540 Processor. 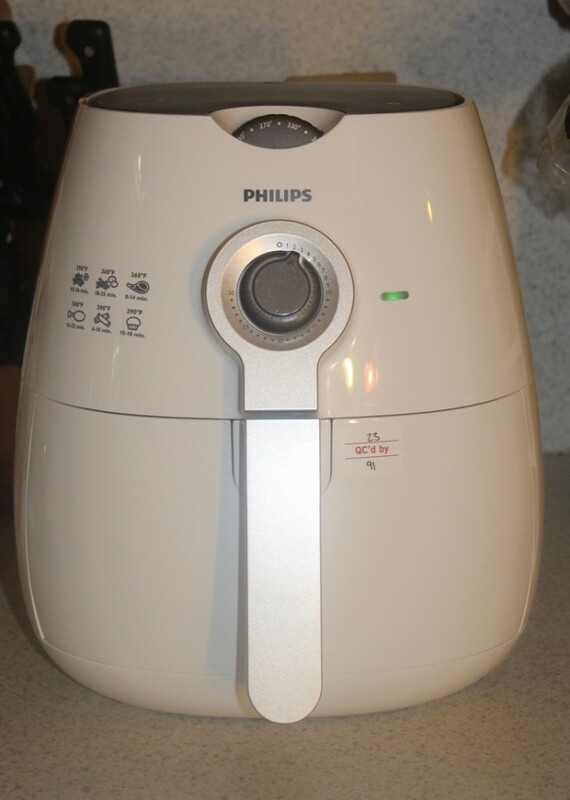 The Phillips Air Fryer is something that not only do I Want….but Something that I Really Need….as I can’t eat Anything that is Fried in Oil/Grease Anymore and there are Just Some Foods that only taste good When FRIED!! I can totally relate. I used to be able to eat fried foods all the time, then suddenly every time I do, I get really sick. This is such a major plus in my life because I can enjoy fried foods without the actual frying! I would love to own the Samsung UN40JU7100 – 40-Inch 4K 120hz Ultra HD Smart 3D LED HDTV. I would love to have that hand blender. I cant even imagine the smoothies and dips I could make with that. Come to Mama! What an awesome giveaway. I need some new kitchen gadgets including a hand blender. Entering! I would love to get a new camera. These are so great! Would love any one of these prizes! COOLPIX P7800 12.2MP 7.1x Opt Zoom 3″ LCD Black Digital Camera is something else that I like. I’d love the Samsung UN55JU6700 – 55-Inch Curved 4K Ultra HD Smart LED HDTV. I’d like to have the Philips AirFryer with Rapid Air Technology. The Philips air fryer looks awesome and would be a great addition to any kitchen. Many great items to help any cook. I would love to have the Cuisinart 64-13 13 Piece Hard Anodized Cookware Set the most. I totally need that Air Fryer. I absolutely love fried foods but, sadly, my waistline does not agree with me. Ditto. It makes pretty rockin’ grilled cheese sandwiches too, by the way. I’ve been eating them like crazy since getting this! Wow what a great prize pack Everything you could possibly want! I’d also like the Cuisinart 4-slice classic metal toaster. I would also love an acer chrombook :). Thank you! I would really love to get the Cuisinart CGG-180T Gourmet Portable Tabletop Gas Grill!! I’d love to get one of these! The Steamfast Steam Mop on buydig is calling my name! I really need a new suitcase before we travel again. I have my eye on the Briggs & Riley carry-on luggage. Great prizes would be a wonderful win. I need a new camera.. the canon power shot is only $109.00! Good luck everyone! Follow my twitter for more giveaways! I would love to have the LG 65EG9600 65-inch 2160p Smart Curved 4K Ultra HD OLED 3D TV w webOS 2.0 as my main TV. Kitchen Aid mixer would be helpful. I’d like to check out the knives! I’d love to get an Amazon Kindle Fire HD. I would love to have the Dell Inspiron 15-5558 15.6″ Touchscreen Notebook – Intel Core i5-5200U. I’d love to win a Samsung 75″ TV so I could watch my beloved Packers in all their glory! I’d love to get the Asus ROG G751JMBHI7N27 17.3″ GeForce GTX 860M, Core i7-4710HQ Gaming Laptop ! Any of the SLR cameras. I have no clue what to look for but I would love to have one! Aroma Professional 5 Quart Heavy-Duty Electric Wok is something else I like. I’ve always wanted to brulee, so I’d get the BonJour Creme Brulee Chef’s Professional Culinary Torch with Fuel Gauge! I would love to have the Cuisinart CPC-600 Electric Pressure Cooker. I have been hearing so much about how awesome they are. Love to have the Cuisinart Advantage 11 piece non stick cook wear set and the electric pressure cooker. I’d really like to have a fitbit or another fitness tracker. I would like lots of things! I particularly like this D-Link Wireless Network Surveillance Camera Built-In Wi-Fi Extender. Thanks! I would like to get the Go Pro Hero 4 Black-4K Action Camera. I would love to try the Garmin dezl 770LMTHD 7″ GPS Navigation System with Lifetime Map and Traffic Updates. I would love a Samsonite Luggage 5 Piece Travel Set. I could always use some new luggage. I’ve always wanted an electric wok. I would love to have the Acme Juicerator 550-Watt Juice Extractor! Oh my gosh I love these!!!!!!!!! 44-13 – Contour Stainless 13 Piece Cookware Set Thanks for these great prizes! Samsung UN78JS9500 – 78-Inch Curved 4K 120hz Ultra SUHD Smart 3D LED HDTV is something else I would like to have. I need the set of knives. I want the Philips AirFryer with Rapid Air Technology. I would absolutely love a good camera. I really like the Canon EOS 6D Full Frame 20.2 MP SLR Camera w/ 24-105mm USM f/4.0L IS AF Lens. I would love to win a tablet. I have never had one or used one before, but they look like they are quite handy! I would like the Cuisinart 12 bottle 2 zone wine cellar. i like the canon digital cameras! I would like to have the Dell Inspiron 15 5000 15-5548 15.6″ LED Notebook. I am in the market for a good camera and the Fujifilm X-Pro1 16.3 MP with APS-C X-Trans CMOS Sensor Digital Camera is awesome! it is a great price too. I need to do more investigation but certainly the prices and products are amazing at that side. I like the Dell Inspiron 15-5558 15.6″ Touchscreen (TrueLife) Notebook – Intel Core i5-5200U. I was *just* telling my husband how much I needed a hand blender yesterday when trying to hand puree pumpkin! I would love to win this! I would also love to have Acer NX laptop….very nice. Oh, I just want that Airfryer! It looks awesome. I would love to get the 8770 Curvy 225-Stitch Computerized Sewing Machine. I would love to get the Rachael Ray Cucina Hard-Anodized Nonstick 12-Piece Cookware Set. I would also love to have the Cuisinart CHW-12 Coffee Plus 12-Cup Programmable Coffeemaker with Hot Water System from Buydig. Would love to win one of the great items you have. What a wonderful chance to win. Wow, that’s an amazing collection you have there!! Thanks for the opportunity to win this prize package!!??? If I had to pick something else to get ready for all that cooking, it would be an Apron!!?? Lol. I know it’s kinda funny but I don’t have one and tend to be a lil clumsy sometimes…sooo, to keep my holiday outfit mess free, I’d need a good Apron!!?? ?Thanks again for this amazing chance!! Happy holidays to all!!??? I would love to get the Samsung UN40JU7100 – 40-Inch 4K 120hz Ultra HD Smart 3D LED HDTV! I could totally go for a new camera. I would love to own the Ricoh WG-M1 Compact Waterproof Action Digital Camera Kit. The other item I would also love to have is the Acer NX laptop. Super excited to win these knives! I would love to get a Calphalon 10-pc. AccuCore Stainless Steel Cookware Set. I would also love the Calphalon 10-pc. AccuCore Stainless Steel Cookware Set. i can agree that looks like the perfect grilled cheese! I like the Contempo 2-Qt. Enamel Whistling Teakettle in red! I would love the pot and pan set. Mine are so out dated. I would love the pot and pan set. I also like the Cuisinart Soft Serve Ice Cream Maker ICE45 (http://www.buydig.com/shop/product/CUIICE45/Cuisinart-Soft-Serve-Ice-Cream-Maker-ICE45). I would love to have the Samsung Gear Fit Dust and Water Resistant Black Watch with Heart Rate Sensor for when I workout. Now those are some fancy schmancy knives! Our are very blah black with silver blades and cracking plastic handles. I would like to have the Cuisinart Compressor Ice Cream and Gelato Maker from buydig.com. Are those knives made of plastic?? Nope. They’re made of stainless steel, like other Cuisinart knives. Just prettier!